BETHLEHEM (Ma’an) — The World Bank released a statement on Friday announcing that $43 million in grants would be provided to projects focused on “improving living conditions and expanding opportunities” in the occupied Palestinian territory. Four projects aimed at assisting life in the Palestinian territory would be funded by the grant money, according to the statement, and would include programs to support municipal services in the territory, electricity sustainability, job creation through the development of the private sector, and a project to address social vulnerabilities in the Palestinian territory — including programs to alleviate poverty and support victims of domestic violence. The World Bank noted that the unemployment rate in the Palestinian territory has reached an average of 30 percent. Last year, the Palestinian Central Bureau of Statistics (PCBS) reported that the average unemployment rate in the Palestinian territory was 26 percent in 2015: in the occupied West Bank, unemployment stood at 17 percent, compared to a staggering 41 percent in the besieged Gaza Strip. Trade unions in the Gaza Strip estimate unemployment there has reached 60 percent. For Palestinian women the gender wage gap in the Palestinian territory has further exacerbated hardships amid soaring unemployment rates. PCBS reported in 2016 that the average daily wage for Palestinian women in 2015 was around 90 shekels ($26), while Palestinian men made an average daily wage of 108 shekels ($31). Israel’s half-century occupation of the West Bank has long been the main contributor to the deterioration of the Palestinian economy. The Bethlehem-based Applied Research Institute – Jerusalem has estimated that billions of dollars of potential revenue have been stifled due to Israel’s occupation. The Gaza Strip, meanwhile, has continued to plummet into a humanitarian catastrophe owing to Israel’s decade-long siege and Palestinian Authority (PA) policies aimed at putting pressure on Hamas, the de facto leaders of the territory, by intentionally exacerbating the difficulties of life for everyday residents in Gaza. In 2012, the UN warned that Gaza could become uninhabitable by 2020 if current trends were not altered. However, a new report released this month by the UN said that “life for the average Palestinian in Gaza is getting more and more wretched,” and that for the majority of Gaza’s residents, the territory may already be unlivable. SALFIT (Ma’an) — Israeli forces shot and injured a Palestinian on Friday while he was tending to his land near Israel’s separation wall in the village of Deir Ballut in the western part of Salfit district in the occupied West Bank. 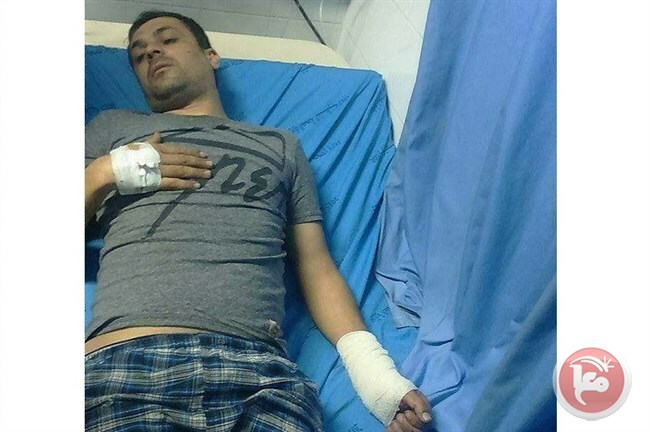 Medical sources at the Palestinian Red Crescent told Ma’an that Faed Saleh Odeh Moussa, 33, was injured with a live bullet in his left hand after Israeli forces opened fire on him while he was on his land watering trees. The sources added that he was transferred to the Yasser Arafat Hospital in Salfit, where doctors reported his injury as moderate. Saed, Moussa’s brother, told Ma’an that they were caring for their land near Israel’s separation wall, like every Friday, when Israeli forces arrived in the area at 7:30 p.m. and randomly opened live ammunition on them. Saed said that they quickly hid behind rocks before his brother was injured. He added that their children were also with them at the time and two men from Qalqiliya city in the northern West Bank who were en route to Israel. Israeli forces remained in the area for some time before leaving following the incident, Saed noted. He added that he had called the Deir Ballut municipality to inform them of the incident, who said that they would notify the Palestinian liaison of the incident. According to the Bethlehem-based Applied Research Institute — Jerusalem, the village of Deir Ballut has had thousands of dunams of land confiscated for the purpose of illegal Israeli settlement building, while Israel’s separation wall — deemed illegal by the International Court of Justice in 2004 — is expected to swallow up at least 35 percent of the village’s lands. Such Israeli activities in Palestinian villages coincide with upticks of Israeli violence against Palestinians — both by Israeli forces and settlers, as Palestinians are stripped of their lands and often barred from entering Israel’s so-called security “buffer zones” on the Palestinian side of the separation wall. The UN has reported that at least 92 Palestinians are injured by Israeli forces every two weeks, while 1,444 Palestinians were injured by Israeli forces this year, as of July 17. However, this data does not include the hundreds of Palestinians who were injured during Al-Aqsa protests post-July 17. BETHLEHEM (Ma’an) — Israeli forces detained at least four Palestinians, two of whom were disabled, during dawn hours on Saturday in the Hebron and Bethlehem districts in the southern occupied West Bank. Locals told Ma’an that Israeli forces raided Hebron city and detained Majdi Radi al-Juneid and Abd al-Ilah Muhammad al-Saed after searching their homes in the city. Meanwhile, in Bethlehem city, Israeli forces detained two Palestinians, who locals said were disabled; however, they did not specify what kind of disabilities the Palestinians were living with. Locals identified the detainees as Hamzeh Abdullah al-Afifi from Doha and Ahmad Anwar Ghneimat, 21, who was detained from a restaurant in central Bethlehem city. An Israeli army spokesperson told Ma’an she would look into reports on the detentions. According to a report released earlier this month, there were 6,300 Palestinians in Israeli prisons as of June, including 300 minors and 486 Palestinians held under Israel’s contested policy of administrative detention — imprisonment without trial or charges. JERICHO (Ma’an) – Palestinian police arrested 54 wanted Palestinians over the past week as they attempted to cross the Allenby Bridge between the occupied West Bank and Jordan, according to a statement released by the Palestinian police on Saturday. All 54 were arrested either attempting to leave the West Bank to Jordan or enter the Palestinian side of the crossing located in the Jericho district. 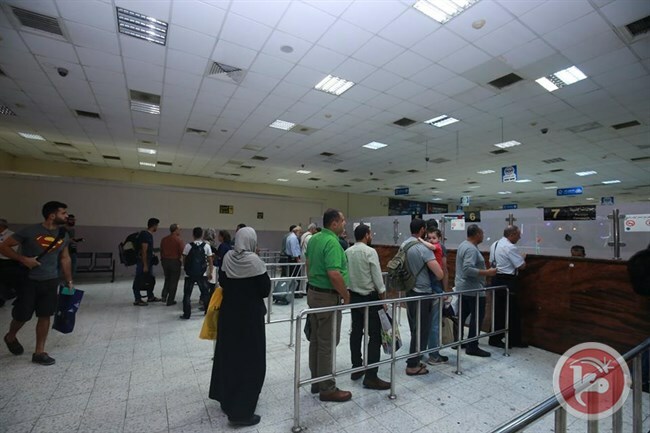 The statement highlighted that 31,226 Palestinians had left the West Bank for Jordan over the past week, while 30,025 entered into the West Bank. Meanwhile, Palestinian security services and other civil departments at the crossing had coordinated the passage of 13 ill Palestinians to travel in both directions via ambulances. In addition, 37 people were rejected from passing the Israeli portion of the crossing for alleged security reasons. Israeli forces, Friday, opened fire at Palestinians who rallied in solidarity with Al-Aqsa Mosque near Huwwara checkpoint, south of Nablus, injuring a photojournalist. Ayman al-Nobani, a photojournalist with the Palestinian Authority’s official news agency (WAFA), was shot and injured with a bullet as he was covering the rally. Israeli forces also fired tear gas canisters at protestors, causing many to suffer from suffocation. This came as heavy Israeli police reinforcements were deployed at the compound and inside the Old City of Jerusalem, in anticipation of heavy clashes following Friday prayers. Fresh clashes erupted after Israeli police, Thursday evening, detained some 120 Palestinians and injured scores of others as worshippers gathered at the holy esplanade, for the first time in two weeks since Israel lifted recent tightened measures imposed at the site. An estimated 120,000 Palestinians had gathered to perform prayers inside the holy site on Thursday evening, after all gates of the site were reopened, though the Remission Gate (Bab al-Hutta), and closed again, shortly afterwards. This came just after Palestinians took to the streets of Jerusalem, to celebrate the re-opening of the compound. Israel has set up the metal detectors and cameras at the entrances to the site and taken other tightened measures, following a fatal attack that left the assailants, three Palestinian citizens of Israel, and two Israeli police officers dead on July 14. Palestinians and Muslim clerics have widely perceived the installations as an Israeli attempt to use Israeli-Palestinian violence to extend control over East Jerusalem and the Noble Sanctuary, further restricting Palestinian and Muslim access. The Palestinian detainee Bilal Diyab, 32 from Kafr Raei town south of Jenin city, announced going on open hunger strike for 16 days in a row. 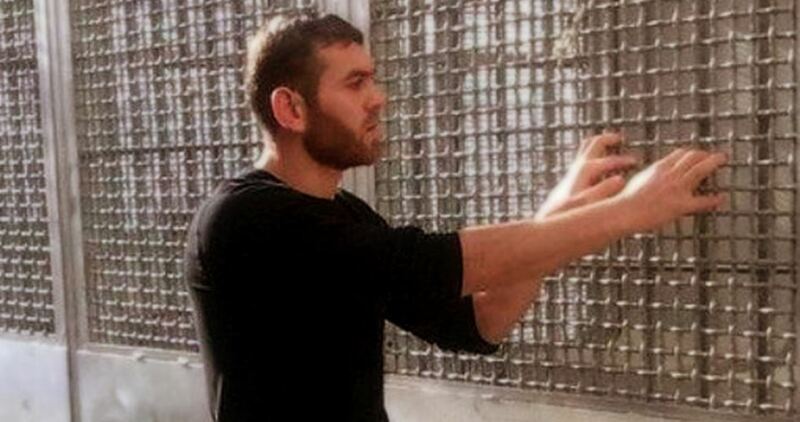 In a leaked letter from Megiddo Israeli jail, captive Diyab said that he has been detained in a solitary confinement cell which lacks basic needs. He has been using his shirt as a towel, billow and prayer mat, he highlighted. Prisoner Diyab, who has lost 7 kilograms since he started to fast, decided to continue his open hunger strike until his release in protest at being detained administratively based on no charge or trial for six months. Israeli occupation forces arrested Diyab after storming his home on July 14. He was among the first prisoners who waged open individual hunger strikes for 87 days in previous arrests. 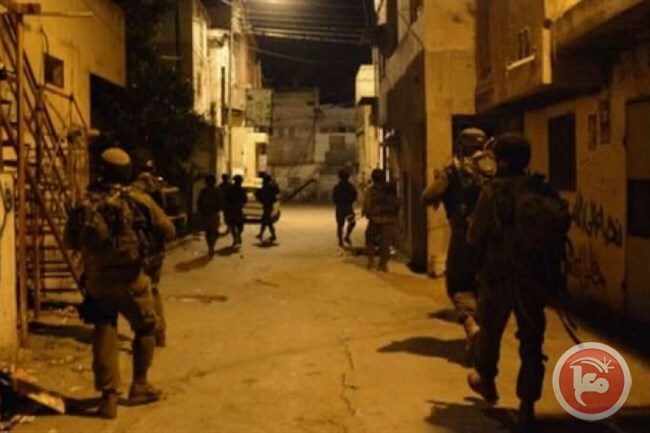 The Israeli occupation forces (IOF) at dawn Saturday raided homes and kidnapped Palestinian citizens during campaigns in different areas of the West Bank. According to different local sources, an Israeli military force stormed Bethlehem city and kidnapped two young men from their homes, one of them with special needs. Another military force also raided homes in al-Khalil city, with no reported arrests. Another young man was reportedly taken prisoner after soldiers stopped him after midnight on Saturday at Qalandia checkpoint near Occupied Jerusalem. 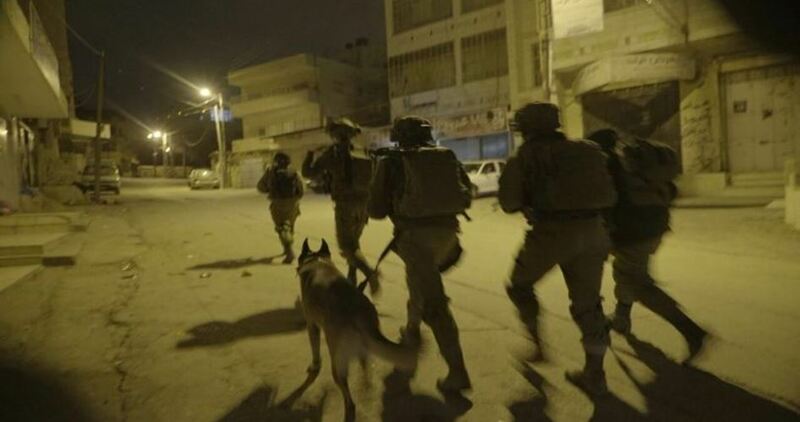 In Qalqilya, a local source told the Palestinian Information Center (PIC) that dozens of Israeli soldiers deployed themselves in al-Daher neighborhood before breaking into the house of Mahmoud Diyab. The source added that the soldiers ransacked the house of Diyab while an Israeli officer embarked on interrogating him. The same military force raided another home belonging to a Palestinian woman called Mona Affanah in al-Naqqar neighborhood of Qalqilya. The IOF also set up a makeshift checkpoint at the entrance to Azzun town, east of Qalqilya, and another one on the road leading to Izbat Attabib village, and obstructed the movement Palestinian citizens. “Israeli security agencies have prepared a package of sanctions against the Palestinian Authority [PA] if it turns out that Palestinian President Mahmoud Abbas and the heads of his Fatah movement are pushing the Palestinians into a clash with Israel in the West Bank,” an Israeli defense source has told Al-Monitor on condition of anonymity. Israel is closely monitoring preparations by the Tanzim, Fatah’s armed wing, for Muslim Friday prayers on July 28. Although Israel has removed the contentious metal detectors from the entrance to Jerusalem’s Haram al-Sharif compound, it appears that Abbas and the other leaders in his movement are not interested in restoring calm and are instead openly calling for an escalation. Israeli officials believe that senior PA officials, especially from the dominant Fatah faction, have interpreted Israel’s removal of the magnetometers in the face of international and regional pressure as a sign of weakness on Israel’s part and are unwilling to stop the momentum they have gathered. Tanzim leaders convened July 26 in Ramallah, the seat of the PA in the West Bank, and adopted a unanimous decision to instigate clashes with Israeli troops. They have designated the events planned as “Jum’at al-Miyadin” (Town Square Friday) and are not only calling on Palestinians to hold public demonstrations, but is also providing them with the means to ensure a mass turnout to confront Israeli forces at roadblocks erected at the entrance to Palestinian towns. This is a dramatic shift for Abbas, who has always been considered an advocate of nonviolence. Fatah leaders insist the protests are part of a popular struggle, but no one really believes that mass demonstrations will not deteriorate into violence. Not only that, but Israeli security officials are convinced that the PA’s goal is to inflame public sentiment, thereby buttressing Abbas’ standing as a leader of the protest and not as a pawn unwillingly dragged along. As previously reported by Al-Monitor, Israel has detected clear signs that since taking office earlier this year, Abbas’ deputy, Mahmoud al-Aloul, has been pushing the Tanzim to confront Israeli troops at roadblocks, and instead of reining him in, Abbas is getting in line with the radical voices emanating from his movement. Along with the head of Fatah’s armed wing, Jamal Mhissen, and Tawfiq Tirawi, the former PA intelligence chief and current Abbas adviser on security affairs, Aloul took part in the Tanzim meeting in Ramallah that called on Palestinians to clash with the forces of the Israeli occupation. Israel has noted that Abbas did not use the past tense in his offer of support, interpreting his comments as a call to “keep up the good work, don’t stop.” At that same meeting, Abbas once again pulled out the international weapon he likes to wield, threatening an appeal to UN bodies and other international organizations, including the International Criminal Court in The Hague. The Israeli source said Abbas’ threat violates his pledge to Jason Greenblatt, President Donald Trump’s Middle East envoy, to withdraw all his demands for international sanctions against Israel to generate a climate conducive for the start of US-mediated negotiations with the Israelis. Friday will also test Abbas’ mettle in regard to the Fatah forces seeking to drag him inexorably into an escalation with Israel. Judging by his declarations, Abbas is indeed heading toward escalation, though unwillingly. Friday also presents a challenge for Israel. Will it be able to ignore the PA’s open support for a call to arms? According to Israeli security assessments, if Fatah and Tanzim activists sense that Israel is helpless in the face of their provocations, their appetite for confrontation will grow. As far as security officials are concerned, Israel must draw a line and make clear that it will not stand for further violence. That is why the government has already updated emergency procedures for dealing with a recalcitrant PA that fails to understand that its leaders are playing with fire. Construction activities are reportedly taking place nowadays in the illegal settlement of Ariel, which is built on annexed land in the West Bank province of Salfit. 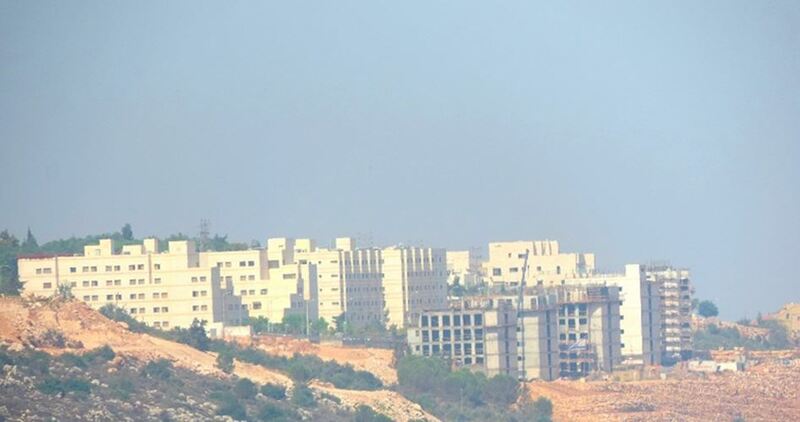 Eyewitnesses told the Palestinian Information Center (PIC) that a large number of housing units are under construction or about to be finished on the northern area of the University, seemingly to house more student settlers. In this regard, local researcher Khaled Maali stated that Israel built Ariel settlement in the first place in order to swamp Salfit and its villages with Jewish settlers. Maali affirmed that the University was established on land confiscated from the local Palestinian residents in Salfit. The existence of Israeli settlements in the West Bank in general including Ariel University is deemed illegal under international law because they were established on occupied land. 15 Palestinian citizens were killed and about 1,400 others suffered injuries during the events that took place recently in Jerusalem and other areas of Palestine over the Aqsa Mosque between 14 and 28 July, according to Palestinian statistics released on Friday. 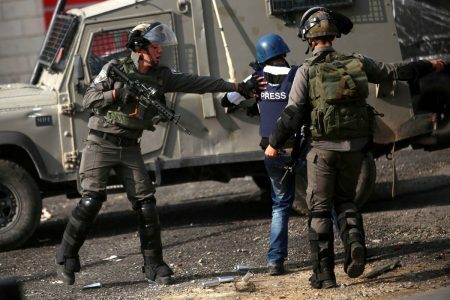 The statistics, which were prepared by Palestinian journalists in the West Bank, showed that the fatalities and injuries among citizens happened mostly during clashes with Israeli military and security forces in Jerusalem, the West Bank and the Gaza Strip. The statistics included the three young men from Umm al-Fahm city who shot dead two Israeli policemen on July 14. Their shooting attack and the resultant Israeli closure of the Aqsa Mosque led to the subsequent events that continued till Friday, July 28. Accordingly, the number of Palestinian martyrs, since the outbreak of the Jerusalem intifada (uprising) in early October 2015, has increased to 345 people, including 83 children under age 18 and 32 women and girls. 70 of those martyrs are from different areas of Jerusalem, 10 from the 1948 occupied lands, 50 from the Gaza Strip, four Arabs from other countries, and 211 from the West Bank. 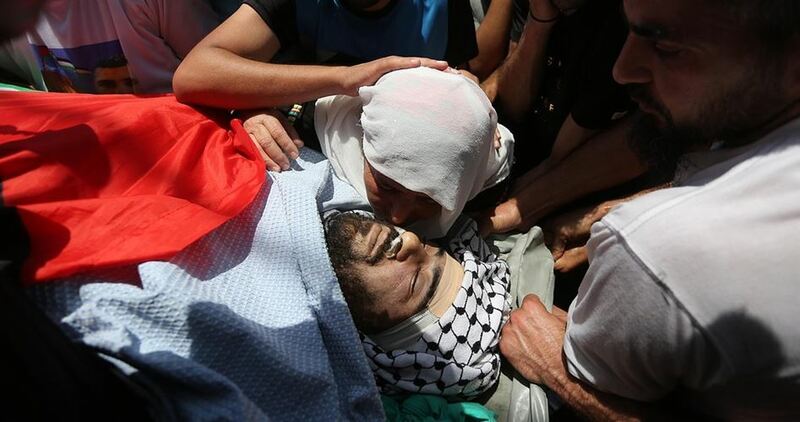 13 bodies of Palestinian martyrs are still being held by the Israeli security authorities, according to the statistics.